Workshops this Spring and Summer are filling fast. 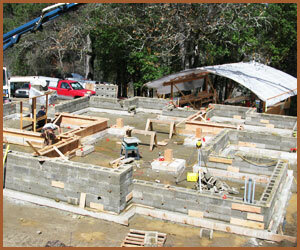 There are only 3 spots left in our Ashland EcoNest Intensive and Timber Framing has been waitlisted. There’s still room in our Salt Spring Island, BC workshop series later this summer. We’re also happy to announce yet another learning opportunity; the Natural Plaster Workshop with Charlie Caruthers, taking place in Ashland, Oregon, October 7th-9th. In the process of building our own Nest in Ashland, Oregon, we have taken the opportunity once again to hone our experience and advice for others regarding the permitting process. Clay/Straw had already been permitted within the City of Ashland and several straw bales had preceded us in the county, so we weren’t anticipating any delays in obtaining a permit. We presented a package of educational material to substantiate our R-values and other material characteristic and submitted the official New Mexico Clay/Straw guidelines, the CMHC study, along with a copy of our EcoNest book. When the usual time for receiving a permit came…and went…we inquired and were informed that our documents had been referred to the Chief Inspector and were awaiting his opinion. We went to the County offices to introduce ourselves in person. The Chief Inspector was cordial and promised to get back to us shortly. He called the next day. What follows is our conversation. Inspector: Plans look good but where is your exterior weather barrier beneath your stucco? Inspector: Code requires a weather barrier beneath your stucco. Robert: Clay Straw walls require vapor permeability. Inspector: Do you understand that the purpose of the weather barrier, as described in the code, is to protect the structure from external moisture? Robert: Yes I understand this to be the case for conventional stick frame building with lightweight insulation such as fiberglass, cellulose and foam. Clay/straw on the other hand, is massive insulation. The clay, due to its exceptional hygroscopic capacity, has the ability to intercept and hold water vapor without deterioration and then release it back to the atmosphere as ambient conditions dry. What happens in a 12” thick wall is elevated moisture on either side will migrate in the form of vapor. The clay will intercept moisture within the first couple of inches of the wall before it reaches the dew point zone of the wall hence posing no threat to the insulating straw or structure which are encapsulated in clay-rich material. Additionally this EcoNest has four foot roof overhangs, masonry stem wall raised 2’ above grade and lime or silicate-stabilized plasters protecting the walls from excessive exposure to bulk water in the form of precipitation. 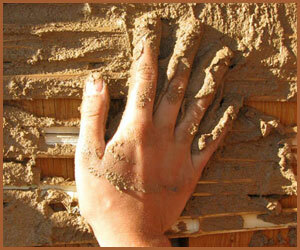 Clay-based buildings throughout Europe and Asia have stood for hundreds of years without any synthetic weather barriers as part of their construction. Inspector: That all sounds good. Do you have any US documentation to substantiate these claims? Robert: No they don’t exist yet. But documents do exist for thermal performance and fire testing. Inspector: Without documentation I can’t issue a building permit. Robert: Can I ask a question? 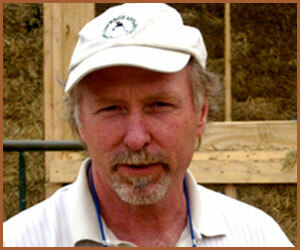 Robert: Have you permitted straw bale buildings in Jackson County? If so what requirement do you have for weather barriers on the exterior of clay/straw buildings here in Jackson County? Inspector: Yes….let me look the requirements up. (after a moment) It says here that only the bottom course of bales requires an exterior protective barrier…..silence for about 10 seconds…. so here we have a precedent …alright you’ve convinced me. I will grant your permit. Inspector: I hope you don’t mind all the questions but this is new here, and new to me, and my responsibility as the chief building official is to make sure anything that is not in the code, in other words an alternative method and material, is viable. I appreciate your experience and patience with educating our department. Inspector: I would like to send Mike and Todd, your building inspectors, to the training. Robert: Great. I’ll bring information to your office. This information is not widely known or well-understood by most building officials. Be prepared to respectfully educate! When Will Prull signed on to become an EcoNest Affiliate I was not surprised, but I was thrilled! Will and I have been working together for over 25 years. 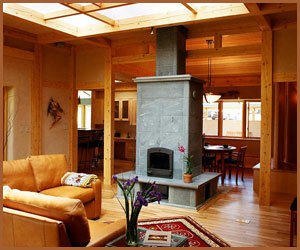 In 1985 we first collaborated on a number of modest passive solar homes which launched both of our careers. Many years later when I began to explore healthy homes, William was both receptive and patient above and beyond the call of duty. He and his team quickly developed expertise in this pioneering field. As we began to develop the concept of the EcoNest Affiliate; a network of talented builders trained in the EcoNest system of building, Will was one of the first to step up to this plate. He is the embodiment of the qualities we are seeking; experience, high craftsmanship, integrity, an ability to truly listen to his clients and a desire to make a significant contribution to health and ecology in his work. Will now has 3 beautiful EcoNests under his belt! Paula: What have you enjoyed most about the EcoNests you have done? Will: I look forward to eventually building one for myself! These buildings are gratifying to me as a craftsman. The materials are interactive and come alive in the hands of the artisan. They are really a very well-thought out, sophisticated and holistic expression of health, ecology and the art of building. Paula: How would you characterize the EcoNest client? Will: EcoNests attract a really special client. These are people who have given a lot of thought to what their homes mean to them. I tell interested folks that building an EcoNest is a lifestyle decision just like eating healthy, organic food or having a garden. I have found my EcoNest clients to be engaged and immersed in the process and I really like that. A real and creative partnership happens between builder and owner. Paula: Can you comment on surviving as a builder in the current economy? Will: The time between September of 2008 and spring of 2010 have been the most challenging in my 30 years of business. I have worked all these years and now, at the peak of knowledge, experience and reputation, and with a new-found perseverance, I am doing well. Not everyone has been as fortunate. If you didn’t build a business on quality, you aren’t in the game anymore! In the Santa Fe area 1/3 of the general contractors are now out of business, long-time businesses servicing the industry have closed or consolidated. I see a 25-40% unemployment rate in the construction industry and it looks like the housing market continues to stagnate. I remain cautiously optimistic. The phone is beginning to ring again! There are still people out there who need good homes.